Other reviewers have called The Author Training Manual a must-read, and I have to agree. Nina Amir has compiled a great amount of research, experience, and real-life samples that can help any other, self-published, traditionally published, or aspiring, to succeed. The manual outlines nine steps that authors should take to achieve their goals. Some of the steps feel more obvious, such as figuring out the benefits of your book and why people will buy it, as well as structuring the content. But other steps can really help authors stand out from the crowd, such as writing out your intentions and sticking with your goals, determining how to make the best use of your time, and thoroughly researching your target market and topic. When writing book proposals, having done research is key to getting the attention of agents and publishers, but it’s not always clear to aspiring writers what information is important to mention. And for self-publishers, having a clear book proposal is the equivalent of having a business plan, which helps to outline budgets and strategy and takes a lot of the stress out of a book’s launch. Though many of the steps seem to easily apply to nonfiction books, Nina often goes into detail on how to apply the plan to fiction books and memoirs, which makes the manual valuable to all types of writers. She also stresses getting an author attitude in order to have the best chance of success. She created an acronym, WOOT, for the four characteristics of an author attitude: willingness, optimism, objectivity, and tenacity. Included in each step are lots of other resources and helpful books, as well as examples of Nina’s students who followed her advice and took their writing careers to the next level. Nina even specifies what changes she made to The Author Training Manual, both during the editing process and before the book was picked for publication. Though it’s great to read through the manual, it’s also very valuable that writers can easily flip through to whatever step they may be on when working on their own book proposals. Nina includes a list of exercises for each step that breaks down what needs to be done, and makes the whole process feel very do-able. Additionally, the book has four samples of book proposals and business plans with detailed feedback from agents and acquisition editors. For aspiring writers, these comments can really help show what people in the publishing industry are looking for. It can also help indie authors see how to create a clear plan. I fully intend to use The Author Training Manual for my future books, at least as a business plan. Being able to work on small chunks at a time and have a concrete plan for book promotion and marketing will really save me time and money, and help me better know what works and what doesn’t. 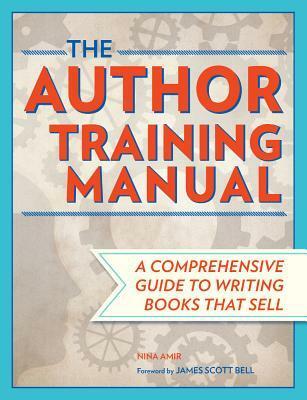 For all writers of book-length works, I highly recommend picking up a copy of Nina Amir’s The Author Training Manual. Sign into Goodreads to see if any of your friends have read The Author Training Manual.